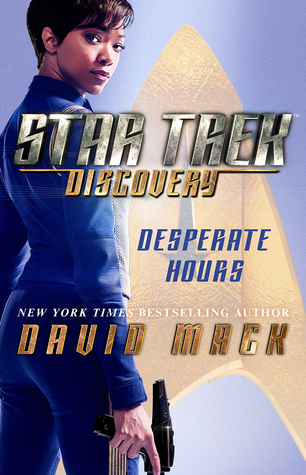 The first book in the Star Trek: Discovery series. The book is set a year before the events in the Discovery’s pilot. It’s set mostly on the USS Shenzhou. It starts with Shenzhou’s second and first officer leaving for other posts. Captain Georgiou must promote people to fill in the gaps. She chooses Lieutenant Burnham for first officer and Lieutenant Saru for second officer. She knows that the two are fierce rivals and don’t have the best working relationship. She makes the posts temporary, to see how they will adjust to the change. Saru is bitter that Burnham was promoted ahead of him. After all, he went through Starfleet Academy while Burnham didn’t. He also resent the time and attention that the captain lavishes on her and feels neglected. Burnham is eager to show her worth to her captain. But sinister things are happening. An independent colony is in danger, when a drilling rig has woken an ancient alien construct, dubbed the Juggernaut. It sends flying drones to attack the cities. The governor and her citizens don’t want Starfleet protection (I guess they want to own slaves or something, I wasn’t really clear on why) but they aren’t armed so they must call for help. However, when Starfleet Command hears about the situation, they send in also USS Enterprise, captained by Christopher Pike. Pike has strict orders that the alien construct isn’t allowed to leave the planet or it will destroy other colonies nearby. The starships must destroy the thing, even if it means destroying the planet – and the colony on it. This is what I wanted when Discovery started so I very must enjoyed the book. We get to know the crew of the Shenzhou, somewhat at least, and get to see captain Georgiou in action with Burnham as her first officer. However, the focus of the book isn’t so much on Georgiou and Burnham’s relationship. Instead, we witness the rivalry between Saru and Burnham and when the Enterprise arrives, the focus shifts to the relationship between Burnham and young Spock who is Pike’s science officer. The book has lots of POV characters on Shenzhou, Enterprise, and among the colonists. I’m afraid that I don’t have much sympathy for the colonists; they seemed very self-centered and stupid (which doesn’t make them unrealistic characters – quite the opposite, unfortunately). The story line pits Pike’s devotion to duty against Georgiou’s principles. I found SC’s orders more than a bit unbelievable; Picard would never have followed them, either. I also had some trouble putting together the aesthetics of Discovery and TOS. Mack does try to explain away the differences between the uniforms, the technology, and ships. Shenzhou is the old warhorse while Enterprise is one of the newest ships, which doesn’t really work for me. There was also some quite unnecessary explanations, perhaps to drive up the word count. Otherwise, I quite enjoyed the book. It’s quite possible that the details in the book, especially about the background of the central characters, will be made non-canon by Discovery’s later seasons. I’ve only watched the first one. This is apparently Kate Elliott’s first book. Sanjay Mukerji and Chryse Lissagaray are newly wed. They’re surprised to find a beautiful deck of tarot cards as one of their wedding gifts. They’re even more surprised when the cards transport them to a fantasy land. Anglia is troubled. The ruler is Regent, Princess Blessa, the aunt to the 15-year old Heir, Princess Georgianna. Also, many of the rich exploit the poor people ruthlessly and many of the poor people are rising up for their rights, because they’re too desperate to do anything else. They also loath the Regent and many assume that she’s going to do anything she can to stay in power. And they’re right: the Regent is a gifted mage and she uses her own deck of tarot cards, her connections, and her ability to manipulate people to get rid of the Heir in a way that she can’t be implicated. But Chryse and Sanjay have more immediate problems because they’re trying to find a way back to home. However, while fleeing rioters, they stumble upon Julian and his dear old friend Kate. Both are drunk but agree to help the couple. At the Vole house, Chryse and Sanjay meet Lady Trent who takes an interest in them. Lady Trent is Julian’s grandaunt and she knows many people. She advises the couple to seek an appointment with a famous seer. 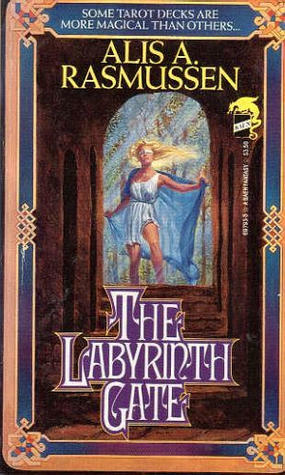 When they finally meet with the seer, she gives them a task: to find her the treasure from the mythical Labyrinth. But others are also after the treasure. The Regent is one them and another is the infamous Earl of Elen. He’s arrogant, cold, and has a terrible reputation for abusing everyone he can. Another is Professor Farr. He’s an elderly archaeology professor obsessed with the Labyrinth and it’s history. 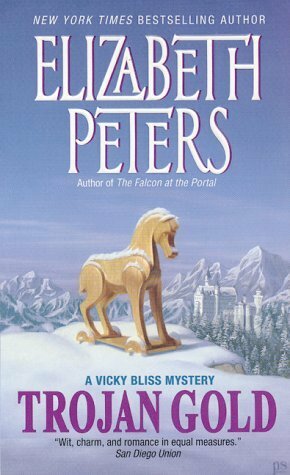 This is a mystery fantasy and I quite enjoyed it. It’s not a thriller. It does have a lot of characters. Chryse is the main POV character but there a lot of others, such as the Regent and Maretha who is the only daughter of Professor Farr. Earl of Elen demands that Maretha marries him and she has no choice. This book has a lot of things I really liked. Of course, Chryse and Sanjay are already an established couple and lovely together. Archaeology is another: most of the book is an excavation trip to the ancient city where the Labyrinth is supposed to be. Tarot cards used as magic is a third. Also, the book has a wonderful wealth of interesting and different women characters. Kate is a tomboy who dresses in men’s clothing and isn’t afraid to say what she means. She’s an aristocrat but has been disinherited by her parents. Lady Trent is in her eighties and has seen a lot of life. Chryse is a musician and a composer. Maretha is devoted to her father. She’s a very capable archaeologist in her own right but is in her father’s shadow. Maretha’s orphan cousin Charity is living with the Farrs. She’s demure but also vain about her looks and we find quite interesting things about her at the end. And of course the Regent who manipulates everyone around her. Basically, where a more common fantasy book would have male characters, we get woman. Which was great. On the other hand, the world-building was more common. The world has other creatures than humans, such as ogres and fairies, but we saw them only briefly. Mostly, we got street urchins who don’t look like humans. While most of the magic is done through the cards, there are other magical forces in the world, too. The Earl uses them quite casually. In place of great men, we again got women. For example, Shakespeare and Mozart where both women in this world and so were most of the rulers of Anglia. Also, I couldn’t puzzle the religion together: people talked of the Bible but seemed to revere Queen of Heaven who has both a Son and a Daughter. The Daughter is the Queen of the Underworld who is also called the Sinner. Fascinating but not enough details. 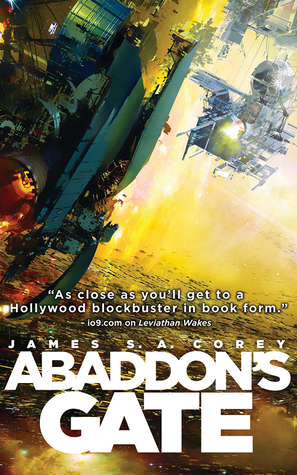 The third book in the Expanse series. 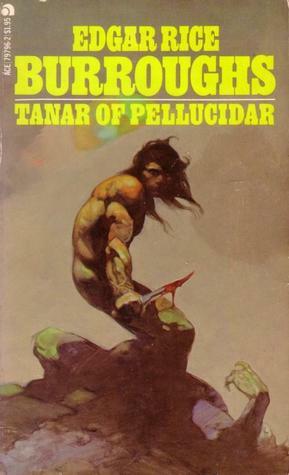 Abaddon’s Gate starts some months after the ending of the previous book, Caliban’s War. Holden and his crew have a lot of money, even after repairing the Rocinante, and they’re celebrating their good fortune. However, something is disturbing Holden a lot. Meanwhile, the protomolecule has created a massive ring construct, called the Ring, near the orbit of Uranus. It appears to lead Somewhere Else, perhaps to that part of the universe where the molecule’s alien designers are. Mars and Earth are sending ships to investigate. From Mars they’re most of the military which was left after the previous book but Earth has sent a group of religious leaders, artists, and other civilians together with the military. OPA can’t afford to be left out. So, they’ve done their best to hurriedly change the Nauvoo to a military ship the Behemoth. Nauvoo was the massive ship that was going to be used for colonizing a planet outside the solar system. It’s not built for war and it might fall apart when the massive rail guns are fired the first time. But the Behemoth is joining Mars and Earth fleets at the Ring. Holden really don’t want to go anywhere near the Ring. He’s looking for any excuse to go the other way. However, Mars has sued him for Rocinante. The only way Holden can keep his ship, which is like a home to him and his crew, is to accept aboard a documentary maker and her crew and head to the Ring. So, that’s what he does. Like in the previous book, Holden is just one of the four POV characters. Bull, Carlos Baca, is a retired marine who is supposed to be the second-in-command of the Behemoth. But Bull is an Earther, even though he’s spent a lot of time in space, and so a Belter is appointed to that position. Bull becomes the head of security, instead. Bull doesn’t like nor respect captain Ashford whom he thinks isn’t capable of really commanding the ship and he fears that the captain will be a liability if things go wrong. So, he must play political games on the ship. But he owes everything to Fred Johnson so he does his duty as best he can. Another POV character is Annushka Volovodov, Anna. She’s a Methodist minister to a small congregation on Europa. She’s also married to a woman and they have a child. She’s asked to join Earth’s civilians in the journey to the Ring and after a short hesitation, she accepts. Through her we see a side of the population we haven’t seen before. She loathes violence and tries to prevent it when she can. She also wants to unite the different factions and show them that they have more in common than they think. Her wife and child travel to Earth and Anna misses them a lot. The final POV is Clarissa Mao, Julia Mao’s sister. She wants to get revenge on Holden by first framing him for a monstrous act and then killing him. She’s very angry and obsessed with her revenge. She doesn’t have as much money as she had before but still enough to get herself a false identity as Melba Koh, a technician, on a ship which is part of the Earth fleet. Her body has been enhanced to a killing machine and so she can, briefly, take out several armed men, as we see in her first chapter. She does sometimes wonder if simply killing Holden is worth the awful things she does. This story starts with introducing the people. Slowly it gathers momentum until it escalates to the end. None of the POV characters were as compelling to me as Bobbie and Avarasarala in the previous book. In fact, my favorite character was Tilly, Anna’s friend. This book also has quite frank discussion of Christian religion which will probably alienate some readers. Politics are a huge part of the book, especially in the latter half. People are doing stupid things because of fear. Fear of the unknown, fear of other people, fear of what other people would do or will do, fear of losing face. Personally, I would have loved it if this book would have explored the aliens and the places beyond the Ring but that didn’t happen here. It’s focused on humans and what they’re doing. Mostly squabbling and then shooting at each other. join Mount TBR 2019 with the same goal of 24 books. Like last year, I’m adding my Fiction River e-books and StoryBundle e-books into the TBR pool in addition to the physical copies but not audiobooks even though I have still unlistened audiobooks from last year. *Books must be owned by you prior to January 1, 2019. No library books~. If you’re looking for a library book challenge or one that counts books on your non-owned TBR list, then please see my new Virtual Mount TBR Challenge.